Last week's Financial Times headline claiming that Google had overtaken Apple in U.S. education--based on data from IDC--was not just technically inaccurate but wildly misleading and served to obscure far more meaningful trends occurring in the PC market, particularly in education as well as the broader emerging segment of new computing form factors. The Financial Times article, written by Matthew Garrahan and Tim Bradshaw, bizarrely claimed that "Apple has lost its longstanding lead over Google in U.S. schools," based entirely upon IDC estimates that stated the collective shipments of netbooks running Google's Chrome OS to U.S. schools had surpassed Apple's iPad sales by 13,500 units in the September quarter. The authors actually admitted half way through their article that the headline was false, noting that "Apple retains a slight lead over Google" when actually comparing the products both companies market to education. Based on IDC's reported numbers, Apple's U.S. education sales of Mac and iPads were not only larger than the corresponding, combined shipments of Android and Chrome OS products, but the "slight lead" Apple had over Google was a margin 172.6 percent greater than the unit differential that Garrahan and Bradshaw directed attention to in their article. However, the reality is that Chromebooks are selling in extremely limited volumes to a single market niche, one that makes up a tiny fragment of the iPad's global market. Additionally, Chromebooks are not even Apple's most significant competitor in eduction, nor are Chromebooks a fledgling new initiative; Google's Chromebook initiative originated before the iPad, it just has never gained any real traction as a product. Far more interesting than the fictionalized narratives staged by IDC--and the journalists who repeat its claims without criticism--are real facts in the education market, including the strategies that have made Apple's iOS and OS X successful while contradicting a parallel narrative that seeks to paint Google's Android platform as both ubiquitous and commercially successful and attempts to portray Chrome OS as anything more than an experiment targeting a tiny niche market. Tellingly, the Financial Times article--and the IDC data that it drew upon--made a series of logical leaps to establish the "news" that "Chromebooks are really gaining traction," and that "the growth of Chromebook is a major concern for Apple's iPad," two soundbites delivered in the piece by IDC analyst Rajani Singh. Chromebook shipments to U.S. education have indeed grown over the past two quarters. Google announced shipments of 1 million Chromebooks to eduction in both its June and September quarters' earnings calls, adding up to more than two thirds of the total number of Chromebooks that IDC estimated to have shipped in all of 2013. To put Google's back-to-back, million unit Chromebook quarters into perspective, recall that Apple sold 3 million iPads in the first 80 days it went on sale in 2010. And while the media likes to portray current iPad sales as foundering and "collapsing," across fiscal 2014 Apple sold an average of 1.3 million iPads every week (the handwringing "iPad collapse" panic is based on the fact that in fiscal 2013, Apple sold nearly 1.37 million every week). 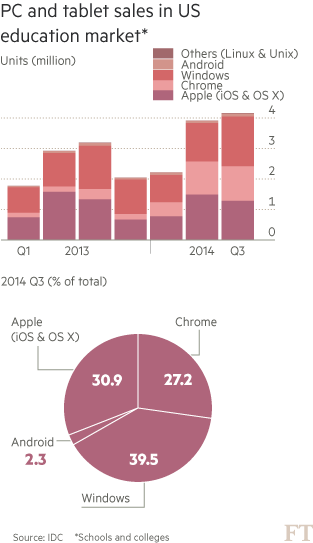 Chromebooks are less relevant as a threat to Apple's iPad sales than Microsoft's Surface. This isn't an argument that Chromebooks are bad or that people shouldn't consider buying them, it's merely an overview of the factually false, misleading reporting that market research groups and their journalist collaborators are foisting on the public as "news." Additionally, as Gartner analyst Isabelle Durand noted in August, of Gartner's estimated 2.9 million Chromebooks sold in 2013, 82 percent were sold in North America, and 85 percent went to U.S. education. "So far," Durand wrote, "businesses have looked at Chromebooks, but not bought many." Businesses have had a long opportunity to look at Chromebooks. 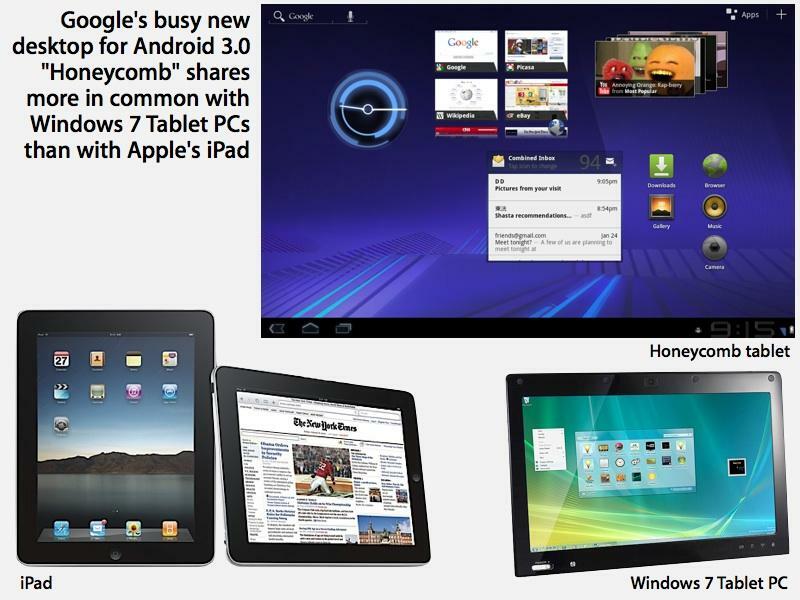 Google first introduced its plans for netbooks powered by Chrome OS in the summer of 2009, six months before the iPad debuted at the beginning of 2010. At the time, Google had planned to bring Chromebooks to market by the end of 2010, but it didn't launch its first model until the middle of 2011. Google's Chromebook aspirations--along with the existing market for netbooks running Linux or Windows--were devastated by Apple's blockbuster launch of iPad. While maintaining work on Chrome OS, Google redirected its efforts to copying Apple's iPad rather than netbooks, rushing to repurpose its iPhone competitor as an iPad-rivaling tablet platform in Android 3.0 Honeycomb the following year, the same year that the first Chromebooks finally shipped. Two years later, while Apple had sold 223 million iPads by the middle of 2013 nobody was making money on Android tablets and Chromebooks were languishing as a curiosity. This January, IDC analyst Loren Loverde was cited by TechWorld as estimating that 2.5 million Chromebooks had sold in 2013, accounting for just 1 percent of all PCs. This occured despite the fact that iPads were clearly causing huge changes in the PC industry, including a remarkable shift in enterprise markets, where Apple had historically had little success. Good Technology has consistently reported across the last two years that Apple's iPad and iOS account for around 90 percent of tablets being deployed by its enterprise users and an even greater share of their custom-developed mobile business apps. The enterprise was supposed to be an ideal market for Google's Chromebooks, which are designed to be dependent on network cloud infrastructure to be useful. That's a disadvantage for consumers who want to install apps or manage their own documents, but creates a value proposition for IT staff who can see the benefits of thin clients that are easy to manage because they don't need to store any local data or software. Essentially, Chromebooks offer to reverse the trend toward BYOD ("bring your own device"). They're largely intended to serve as easy-to-mange, cheap-to-deploy corporate fleet netbooks. But when asked about Chromebook traction in the enterprise, IDC's Loverde answered, "Beyond education, it's probably virtually zero." An October article by Charles Arthur for the The Guardian cited data by ABI Research that estimated total 2013 Chromebooks at just 2.1 million units. It's a little bit curious that ABI, IDC and Gartner can study Chromebook shipments and report numbers that differ by 800,000 units, a figure that is more than 10 percent larger than the total number that IDC is now claiming were shipped to U.S. schools in the last quarter. The "variation" in 2013 Chromebook estimates between the market research firms is also about 60 times larger than the difference in U.S education units between Chrome OS and iPads that IDC claimed to be a "major concern" for Apple. Yet the former didn't seem to strike many journalists as even significant, while IDC's comparison of estimated, peak Chromebook shipments to schools in one country--compared to its estimated iPad sales in Apple's post back-to-school quarter--was. While the vast majority of Chromebooks are being shipped to U.S. schools, Apple's chief executive Tim Cook revealed last winter in comments to analysts that "U.S. educational institutions have purchased over 7 million iPads," or just 3.6 percent of the 192 million iPads Apple had sold to date at that point. This July, Cook similarly stated "we've now sold 13 million iPads to education customers globally," which out of the 223 million iPads sold at that point, means that only 5.8% of global iPad sales had been sold to education in total, everywhere. The fact that IDC looks at the roughly 70 million iPads sold each year and creates statistics that claim Apple's market share among tablets is on the brink of disaster, while looking at two million Google Chromebook shipments to one seasonal market segment in one country and proclaims to the media that the platform is "gaining traction," says a lot about the function and purpose of IDC. Does Samsung not know that "Chromebooks are really gaining traction," or is IDC simply promoting failed initiatives on behalf of its clients again? If IDC similarly calculated Chromebook "market share" against other netbooks and notebooks the way it compares iPads to kids tablets and toys, it wouldn't be able to claim with a straight face that "Chromebooks are really gaining traction." On the other hand, if IDC reported data that reflected reality, it might have been able to predict that Samsung--the world's largest producer of Chromebooks--would abandon Google's netbook platform along with its Windows notebooks in Europe because they weren't selling well, as the company announced it would do in late September. Does Samsung not know that "Chromebooks are really gaining traction," or is IDC simply promoting failed initiatives on behalf of its clients again, as it has previously done for conventional netbooks PCs, and the Microsoft Surface (both the first failure to ship under that brand, as well as the later netbook) and, most recently, new 2-in-one hybrids (all of which happen to be built by IDC clients). In early 2011, IDC analysts observed that with its Windows Phones, "Microsoft has steadily lost market share while other operating systems have brought forth new and appealing experiences," but turned those facts around with a bold prediction that by 2015, Microsoft would gain significantly greater market share in smartphones (20.9 percent) than Apple (15.3 percent). With 2015 just a couple weeks away, Windows Phone now has trivial global market share in phones (about on par with Google's Chromebooks among PCs), while Apple's iPhone now has 40 percent or greater share in the U.S., U.K., Australia and Japan and higher share than IDC predicted even in China and across Western Europe. Go all the way back to 1997, and you'll find IDC was predicting that Intel's 64-bit Itanium chip would balloon into a $38 billion annual market by 2001, erasing any chance of success for PowerPC. As it turned out, Itanium wasn't even released until 2001, and only sold a few thousand units. PowerPC had a far more successful run. Conversely, a generation later IDC failed to predict that Apple's 64-bit Ax Application Processors would obliterate the market for high end mobile chips and dramatically shift priorities for Qualcomm and Intel. Anyone with basic access to data could have predicted that, but such a prediction wouldn't serve the interests of IDC's clients (particularly Intel! ), so it coincidentally didn't get packaged up in a press release with persuasive charts and delivered to journalists who print whatever the company says is news. IDC also has a hard time "estimating" Apple's sales of Macs, even though Apple publicly reports its actual Mac sales in its SEC filings. Last quarter, for example, IDC "mis-underestimated" global Q3 Mac shipments by more than 10 percent, "preliminarily" reporting 4.98 million Macs, rather than the 5.5 million Apple actually sold. The quarter before that, IDC reported that U.S. Mac sales were down 1.7 percent over the previous year, rather than seeing the "double digit" Mac growth in the U.S. that Apple actually reported. IDC's currently reported figure for last year's Q3 Mac sales is 4.577 million, but last year the firm portrayed Apple as being outside of the top five PC vendors, with sales lower than Asus, which it said sold 4.2 million PCs. That demands a retrospective discovery of at least 377,000 Macs it didn't notice last year. Oops. Counting Chromebooks should be harder than counting Macs. No companies actually report how many Chromebooks they sell. Conversely, IDC retroactively eliminated 1.7 million PCs from its global shipments reported one year ago, enabling it to claim this year that the overall PC market had only slipped by 1.7 percent, rather than the 3.8 percent contraction its original figures indicated. Counting Chromebooks should be harder than counting Macs. Acer, Dell, HP, Toshiba and Samsung are all fighting over the U.S. Chromebook education market, which collectively reached a peak of 715,500 units in Q3, IDC states. None of those companies report how many Chromebooks (or PCs, or tablets) they actually sell. How is IDC so confident in its tally of 13,500 Chromebooks when it routinely loses track of 300,000 to 500,000 Macs essentially every quarter? 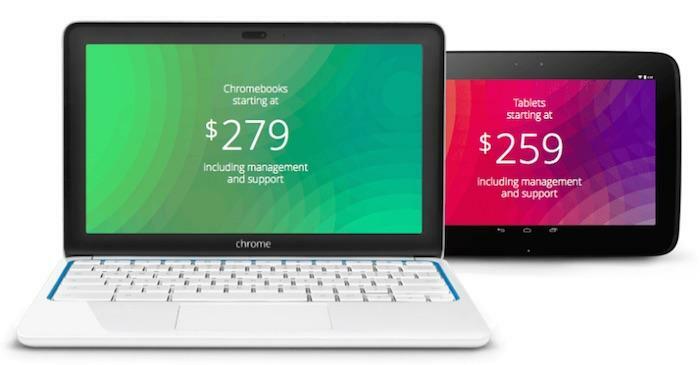 Some Chromebooks are cheaper than the not-the-cheapest iPad! In addition to endorsing the legitimacy of IDC's claims that "Chromebooks are really gaining traction," the Financial Times article was effective in promoting the idea that Chromebooks are much cheaper than iPads. Google's search results for one line from the article, "Chromebooks start at $199, while last year's iPad Air, with educational discounts applied, costs $379," now turns up 118,000 matches from around the web. 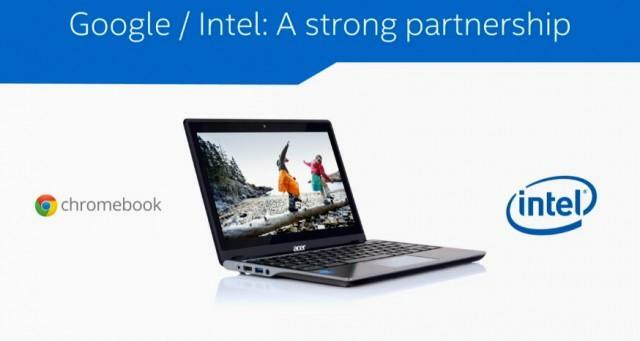 Entry level Chromebooks may start at $199, but models commonly cost between $200-400. Conversely, iPad Air is not Apple's cheapest iPad; education pricing actually starts at $234 for iPad mini. Schools are indeed buying iPad minis. Cook noted in Apple's most recent earnings call that, "in the September quarter the St. Paul public school in Minnesota purchased over 22,000 iPad Airs and over 5,000 iPad minis in the first race of the district's personalized learning through technology plan that will ultimately equip every student with an iPad." Schools also routinely buy service contracts, which typically cost more than any discount hardware savings. And really, the idea that schools are adopting Chromebooks because they are cheap calls into question why schools are not similarly adopting cheap Windows netbooks or Android tablets. Even more troubling is the fact that Google's Chromebook for education page states that Chromebooks start at $279, which is more expensive than Apple's entry level education price for iPads and 40 percent higher than the article reported that Chromebooks actually cost education buyers. But why should the Financial Times care about facts, particularly when it comes to financial issues? Pay no attention to the lack of Android tablets in education! While focusing on the supposed traction and purported upfront cost savings of Chromebooks, IDC has long reported (at least in its paid reports that are not public) that no other tablets rival iPads in education. 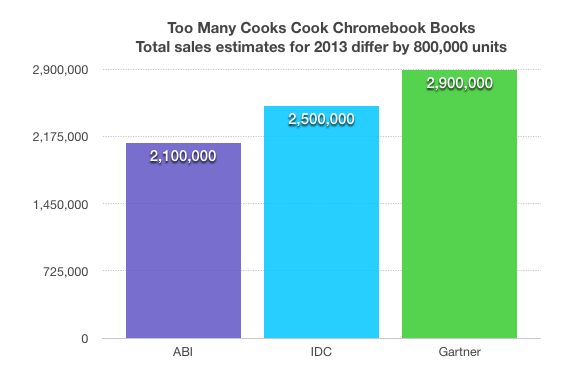 In October 2013, Cook was asked by an analyst about the impact of Chromebooks in education. He answered, "we had our best education quarter ever. We went over a $1 billion in revenues for the first time ever. We were up strongly year-over-year up 8%. iPad was up 22% year-over-year and the Mac was up 8% and as you know the PC market was down 10% in the aggregate and likely down even more in education. "And so we feel like we're doing great on both fronts, both in the iPad space and in the Mac space for people wanting to buy Mac. 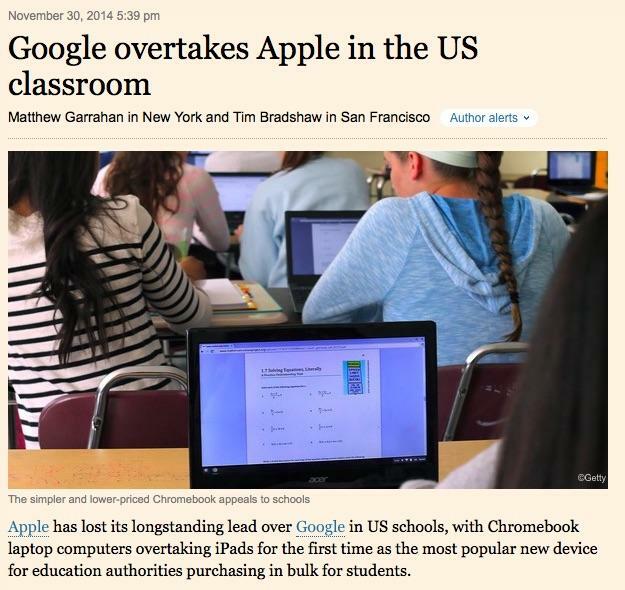 And we do see Chromebook's in some places, but the vast majority of people are buying PC/Mac or an iPad. Our share of tablet in education is 94%." In contrast, IDC's latest figures state that Android tablets make up just 2.3 percent of all U.S. education sales, which if you do the math works out to about 60,000 devices. Tablets powered Windows (or anything else) amounted to another 40,000. 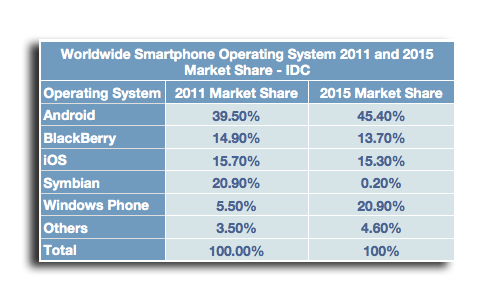 These numbers are all small enough for IDC to simply overlook them had they been Macs. Take note of the fact that IDC hasn't publicized data on education tablets in press releases, at least not until Google's licensees collectively shipped enough Chrome OS netbooks to compare favorably, as a composite, to Apple's iPad sales. The factually-troubled report by Financial Times repeatedly stated that Chromebooks are "sold" by Google, which is also puzzling because Google doesn't even earn licensing revenues from Chrome OS hardware sales. The only Chromebook that Google directly sells is the Pixel, a high resolution premium web-based netbook that starts at $1299, more than any iPad Apple sells. Google doesn't sell very many of these, certainly not to education. The effort to shift in attention away from Android tablets--which aren't selling well in either enterprise or education--to Chromebooks may be related to Google's aspirations to migrate users away from Android due to ongoing intellectual property infringement issues; the departure of Android's founder and the rise of Chrome OS' lead to chief executive; and Google's natural affinity for web and cloud-based products, rather than Android's JavaVM-style app platform. That's a difficult shift for Google to make, particularly given the astounding lack of interest in Chromebooks that consumers have demonstrated over the five years since Google first outlined its plans for web-based netbooks. The company has stumbled upon most receptive audience: schools that are willing accept shipments of the netbooks to try out Chromebooks as managed thin clients. It's fortunate for both Apple and Google's licensees that the education market has plenty of room to accommodate multiple vendors. IDC's data indicates that despite a relatively massive influx of Chromebooks over the last two quarters (an expansion of the market of about 33 percent), Apple's U.S. education sales have remained at record levels in line with its historical seasonal cycles. The Chromebook schools that certain journalists have happened to identify in their research profiling education sales (just kidding!) are described as districts who couldn't afford iPads, making them prime targets for Google's philanthropy. It's certainly not a bad thing that Google and its licensees are pushing functional technology into U.S schools, even if there's a parallel commercial motive behind developing Chromebooks into a viable product for commercially relevant markets such as the enterprise. However, time is not on Google's side. By focusing on single market segment in one country, Google's Chromebooks will continue to lack the vast economies of scale that Apple's iPad business enjoys due to its broad popularity spanning from consumers to enterprise to education on a global level. Those economies of scale are enabling Apple to rapidly develop advanced new silicon and software innovation, ranging from 64-bit ARMv8 processors and high end mobile graphics (below) to the new Swift language and Metal API that exploit those hardware advantages, as well as the ability to access cloud storage from multiple vendors (something Chromebooks can't do by design). Additionally, apart from creating cloud customers for Google, the business case for building Chromebooks is not really clear, outside of creating an arbitrary alternative to Windows. Selling Chromebooks is actually less profitable for manufacturers than Windows netbooks because the costs of marketing them are higher. Microsoft has also dropped its licensing fees for low end devices, aiming at a pyrrhic victory in netbooks. Gartner's Durand noted, "now that the PC market is no longer growing strongly, vendors are searching for new business opportunities. They launched Chromebooks to revive interest in sub-$300 portable PCs once the netbook bubble had burst." Q: How does a netbook bubble passively burst itself? A: When iPads are invisible! Google also recently announced it would stop serving advertising to students using Chromebooks' Google Apps for Education, and would stop collecting and using student data. Without Android-like ad revenue or hardware profits, it's hard to imagine what will maintain the Chromebook apart from the hot air of advocacy journalists, which hasn't been able to successfully prop up other failures ranging from Google TV to Microsoft Surface. And with Google's PC web search business (which contributes the vast majority of its revenues and profits) running out of steam as conventional PCs peak and Apple's iOS increasingly drives users to apps rather than to a browser search page monetized by Google, the company's ability to push licensees to ship loss leader Chromebooks to U.S. schools appears to be unsustainable. The reason why IDC is working so hard to promote Chromebooks as "gaining real traction" is much easier to understand: Intel is heavily invested in leveraging Chromebooks to win back mobile market relevance from ARM, after having failed to gain any from Atom-based Android tablets or Windows netbooks. Prepare to see a lot more "news" reports about how a few million Chromebooks are dramatically shifting the market in ways that a quarter billion iPads haven't, because there's a lot of money on the line.